"The superlative used when a friend shares such exciting news with you that no other word embodies the excitement you feel over it." A friend of mine used this word the first time I heard it. I kept trying to make it be a "thing", yet my husband and another friend cringed every time I would throw it out there...basically I gave up on it. Until now! 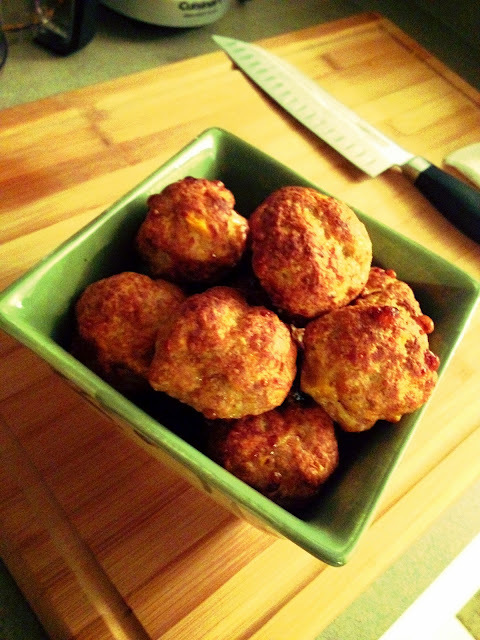 These chicken meatballs are so good, no other word can embody the excitement I feel over them. Therefore, I have brought "Amazeballs" back! How is that for not having a Masters degree in words??? 1. Ok basically I sauteed 1/2 the onions, garlic, and carrots (add salt, pepper, and red pepper) until it was cooked down and caramelized...then I put it into the fridge to cool off. 2. In a large bowl I combined the chicken meat, egg whites, the other half of the raw onions, garlic, and carrots, sriracha, cheddar cheese, and some more salt and pepper. 3. After the cooked ingredients have cooled off (I gave it about 10 minutes in the fridge)...combine with chicken meat, and mush it all together. If it is still too wet, add more breadcrumbs. I have no clue how much I ended up throwing in there. It seemed like I had to keep dumping more in because it was sticking to my hands too much. Be careful though, you don't want it too dry! You just need to be able to roll the meat in to balls without it sticking to your hands. 4. Spray a baking sheet with non-stick spray. Roll the chicken meat mixture into 2 inch balls....cook for 30-40 minutes until they are golden brown. 5. Serve with the thai sweet chili dipping sauce...so good!!! !